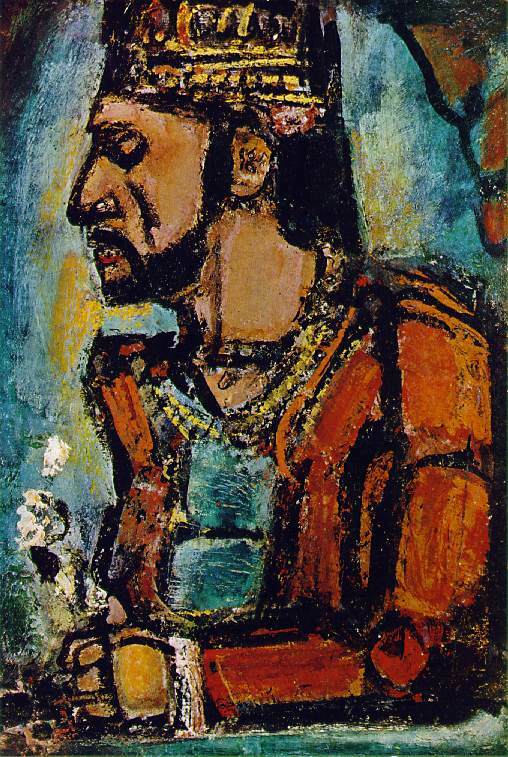 Few artists of this century have ever scaled such spiritual heights or plumbed such depths of human degradation as Georges Henry Rouault (pronounced Ru-OH). The depths were expressed in his prostitutes whose nakedness he painted obsessively. A critic referred to them as, "...gutter Venuses in poses of epileptic toads." Yet spiritual achievements in watercolors, gouache, oils, aquatints, and lithographs were so vast they constituted an iconography of religious endeavors unmatched by any artist of his time. When one considers the explosive power of his work, smouldering with sonorous color, searing reds, and cobalt blues, it's surprising that fame came so late in his lifetime. It wasn't until after WW II when he was in his seventies that the world came to appreciate his talents as a "painter's painter". Born in 1871, Rouault's earliest art training came as an apprentice stained glass painter. The heavy, leaded qualities derivative of this background were the most significant aspect of his work. His contrasting masses of flesh were always delineated by solid, weighty outlines in black that seemed to make his positive spaces glow from within. He once declared his ambition to paint a God so moving that those who saw him would be converted. In his aquatint series, The Miserere, he came close to succeeding. His attempt to create the irresistible Christ was the beating heart of Rouault's long, faithful, productive life. In 1916, he began one of his most famous paintings, The Old King. He was still working on it in 1936 when the art dealer Ambroise Vollard persuaded him to release it. This twenty years of "work in progress" is characteristic of the master. He apparently worked at least that long on most of his major works, and even longer on his Miserere series. 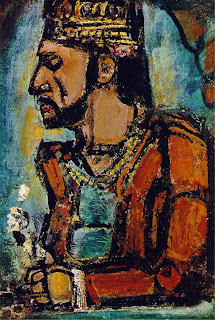 Rouault died on February 13, 1958. So beloved was he that a period of national mourning was declared throughout France and his funeral was an occasion of state. His mourners were legion. Among them were the last of the "old guard"--Picasso, Dali, de Chirico, and Braque. He was 87.
what was his biggest accomplishment? LOL, yes, I'm still alive. I'd say his painting seen above of The Old King would probably be considered his greatest accomplishment. It's by far his most iconic work.